You will find in this page all the Orthopedic Ankle and Foot Supplies for all your ankle needs. In our catalogue you will find foot supports, insoles and inserts, available in all different sizes and for different applications and needs. Our Orthopedic Ankle and Foot products are all from the best manufacturers. 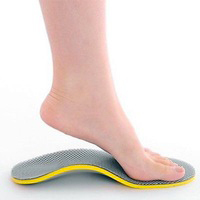 Besides Ankle Support and Insoles, we also carry toe splints, corn pads and open toe cast boots. When nursing and going through rehabilitation, these products will help you heal from your injuries and get back on your feet in no time. They will provide comfort in times were it is the most needed. So go ahead and take a peek into our catalogue and you will find a large selection of items.